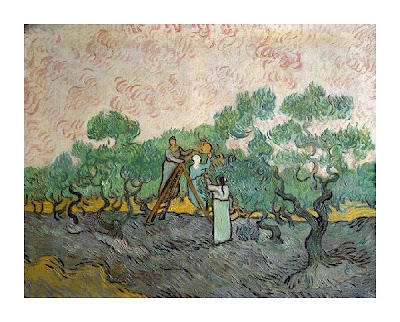 This painting’s title is “Women Picking Olives.” Vincent Van Gogh painted it. The trees look very scary. The trees look scary because the branches are curly. When the wind blows the trees make a swishing sound. There are so many dull colors in this picture. The dark colors make the picture scary. For example, the ground is grayish and the sky is dark pink. I chose this picture because I like the dull colors. I imagined that I was one of the ladies in the olive grove. I picked an olive. The olive felt so soft and it was easy to squeeze. The olive tasted bitter. The olive grove smelled like cotton candy perfume. I loved the painting of the ladies picking olives. I wish I could with the ladies and tasted the olives. Maybe they tasted liked they smelled. Like Cotton Candy!! I wish I was one of the ladies picking olives. Do you think the olives can smell like cotton candy?